Through the inspiring work of Dr Zsuzsoka Kecskes, sick babies born in Canberra are getting a better start in life. Zsuzsoka has pioneered the development of the international award-winning Neonatal Intensive Care Unit CAM (NICUCAM) project - a web-based service which enables parents and families to watch their babies when they are unable to be at hospital. NICUCAM is the first of its kind in Australia. 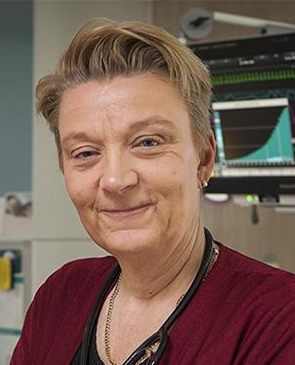 Clinical Director of Neonatology, Zsuzsoka was already an influential academic and practitioner when she embarked on a four year project to design and develop a world-class Neonatal Intensive Care Unit (NICU) at Canberra’s new Centenary Hospital for Women and Children. Zsuzsoka collaborated with families who had experienced neonatal care at the hospital to develop a family-friendly, baby-focused facility. Zsuzsoka is passionate about patient-centred care and is also an Associate Professor at the Australian National University Medical School. She has been recognised for her work into perinatal asphyxia and her research continues to inform best-practice treatment of newborn babies in Australia and around the world.